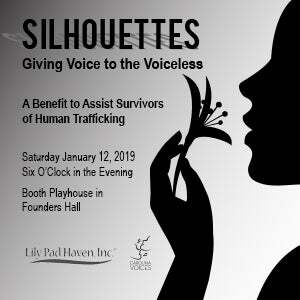 In honor of 2019 National Human Trafficking Awareness Day, Carolina Voices and Lily Pad Haven, non-profit organizations in the Charlotte area, have joined forces to build awareness of, raise funds for and honor the strength and bravery of human trafficking survivors in the Charlotte Region. This inaugural event will include outstanding choral music, a powerful soloist, insightful poetry and inspiring dance performances. Event tickets are a perfect holiday gift for that hard-to-buy-for person on your list. What a great way to help others and kick off 2019!